Are you searching for a closed captioning service that requires no new software and no setup fees? One that can help with all of your closed captioning and subtitle needs, quickly, affordably, and with great customer support? Search no further. Start with a clear recording and a transcript and CaptionSync will produce closed captions with precise timecodes ready for use on any video platform. 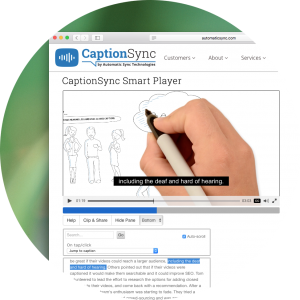 We offer nearly 100 different caption output formats, including many that are only available from CaptionSync. Choose as many formats as you need at no extra charge, and receive your caption files within minutes via download, email, or delivered directly to your video platform. No transcript? 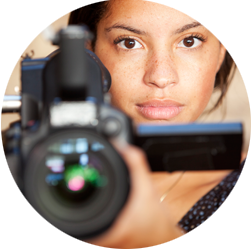 We’ll transcribe your videos for you, accurately and quickly. 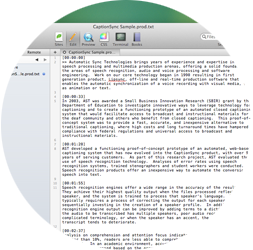 Production transcripts, or time-coded transcripts, are full transcripts of your media file with a periodic time stamp. Time stamps are typically placed at every speaker change, and periodically within a speaker’s monologue. CaptionSync allows you to select the frequency of time stamps to suit your needs. Production transcripts are helpful for video editors to quickly locate segments of interest for editing — saving significant time in post production. Production transcripts can also be used for interviews, focus groups, depositions, and panel discussion recordings. AST provides a number of tools for our users that make the captioning process easier, including our online caption editor for quick caption edits, our AST-Link bulk uploader for cases when you have multiple video files to upload, an integration with Dropbox, and our CaptionSync Smart Player, which provides enhanced caption features such as interactive transcripts and video search functionality. If you have feature films, television dramas, or other dramatic narrative content destined for television, DVD, iTunes, Amazon Instant Video, Hulu, Netflix, or other video on demand (VOD) services, AST’s Cinema Certified Result Review is the appropriate service for your post-production closed captioning needs. Customers with moderately sweetened content can take advantage of our standard Result Review service. Copy Editing, DVD/MP4 transfer service, workflow integration assistance, and video SEO round out our service offerings. 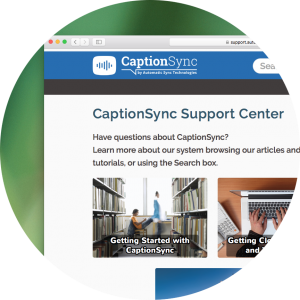 AST strives to make captioning as simple as possible with CaptionSync, but the number of applications and players that ingest caption files is immense, so the topic can get complex. To address this, AST devotes significant resources to supporting our users. Our extensive Support Center has FAQs, knowledge base articles, best practice articles, and tutorial videos. Search functionality helps users locate the information they need, and users may also submit support tickets to have their specific questions addressed directly. Our users rate our support with a satisfaction rating of over 98%. AST’s automated captioning service has enabled UC Berkeley to provide captioned webcast lectures in a timely cost-effective manner. AST’s CaptionSync is exceptionally fast and accurate, and they were able to work with us to accommodate our specific requirements. Our work with AST has resulted in a higher quality course delivery to our students. The NSF panelists were impressed with our efforts to broaden the accessibility and usefulness of our online teaching materials and they thought the search feature added a level of functionality far beyond just subtitles. Thanks! AST’s captioning has helped us achieve online accessibility for NASA’s Destination Tomorrow, the NASA SCIenceFiles™, and NASA CONNECT™ quickly and cost effectively. And we are all set to do video search at no additional cost! Your product has made my life so much easier! Automatic Sync Technologies’ automated CaptionSync service provided KBTC with great pop-on closed captions in a fraction of the time and at a fraction of the cost of conventional techniques. And with their excellent customer support behind it, I highly recommend it. I think your service is really great. It was straightforward and fast. AST provides service and support in a timely manner and with a personal touch. Their service is easy to use, accurate, and provides a quick turn-around. AST takes a sincere interest in making us successful. I’m amazed at how fast you turn these things around. The mail in DVD service is great, I simply send in my VHS tapes and get back beautiful captioned dvds… with AST I never get anything less than excellent! Automatic Sync Technologies was instrumental in making our content accessible for anyone interested in exploring technology. 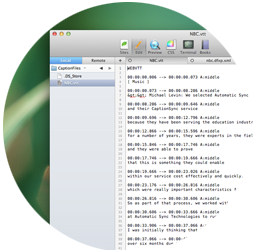 AST’s CaptionSync provided us with tremendous value through the search engine optimization of captioning data. I just wanted to say on behalf of our organization that CaptionSync has been a huge benefit for us already. Timecoding that used to take us four days via manual tools now takes four minutes, and the output is just as good as our old manual processes. We’re really happy with this tool. At Cal Poly we recognize the potential benefits of lecture capture technology for our students. To deliver these benefits, it is critical that the solution be simple, fast, scalable and accessible to all of our students. Panopto and Automatic Sync are addressing these challenges. By leveraging caption data to provide lecture navigation and search features, the CourseCast platform allows us to create content that is both accessible and helpful to our users. I was really blown away with how well your service worked on this series of jobs. Many of the speakers in these videos spoke with thick, foreign accents. I was truly impressed with the results. There were no problems whatsoever caused by the accents of the speakers. There were cases that I could barely understand what the people were saying, but the captions ended up being dead on with the audio. Truly amazing! The level of service that we receive from them is superb. Whenever I have any technical problem, which is extremely rare, their customer service department responds immediately. We see the Brightcove/AST solution as a convenient, low cost way to provide equal access to all. The turn around time of AST is fantastic and their low cost makes this feasible to universities, especially during this time of budget cuts. For the past three years, despite having explored other captioning providers, we have always returned to AST. The quality of their work, turnaround times, overall responsiveness, and entrepreneurial spirit have made them the ideal partner for our major projects. The process that AST has developed for creating closed caption video content for web and broadcast has been a terrific asset to our institution. AST’s superb customer support and great educational pricing makes it inexcusable for us not to provide our educational video content with captioning. Riverside Community College District holds an extensive collection of video media. AST’s easy-to-use system has made the task of captioning all of it much less daunting. 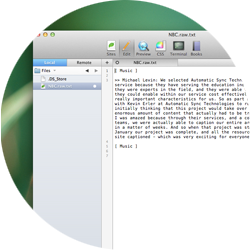 Automatic Sync has been a reliable and easy to use service for generating caption data files. They support every format I can think of and have worked with us when we’ve needed support for a new format. They are very responsive and their technical support has been fabulous. Your transcription and captioning services are excellent! The quality of the results along with your customer service to respond quickly to questions or minor issues has been top-notch as well! I would highly recommend this service to others that are looking to close-caption videos. We’re incredibly pleased with the results; the captions are excellent, the turnaround time was amazing, and the cost efficiency is by far the best we’ve encountered from any captioning service. Without CaptionSync, I would have had to break deadlines and disappoint the client. Your service is worth every penny. Award Productions used AST’s automated captioning system to complete a recent web captioning project. From the start of the project until its completion, AST’s system made it a pain-free process. Thanks to AST’s caption technologies we were able to turn around a big project in a minimal amount of time. It was a pleasure to deal with a company that has outstanding customer service and a great product. We have used AST for many years because of their high quality and speed. To have CaptionSync integrated into our system is an enormous benefit. They have the technical expertise gained by many years of experience in the field…. I would not hesitate to recommend this service. We found their results to be highly accurate with a quick turnaround. We have been very happy with the level of service they provide.